After a week of eating lots of salads, I decided it was time for a treat. 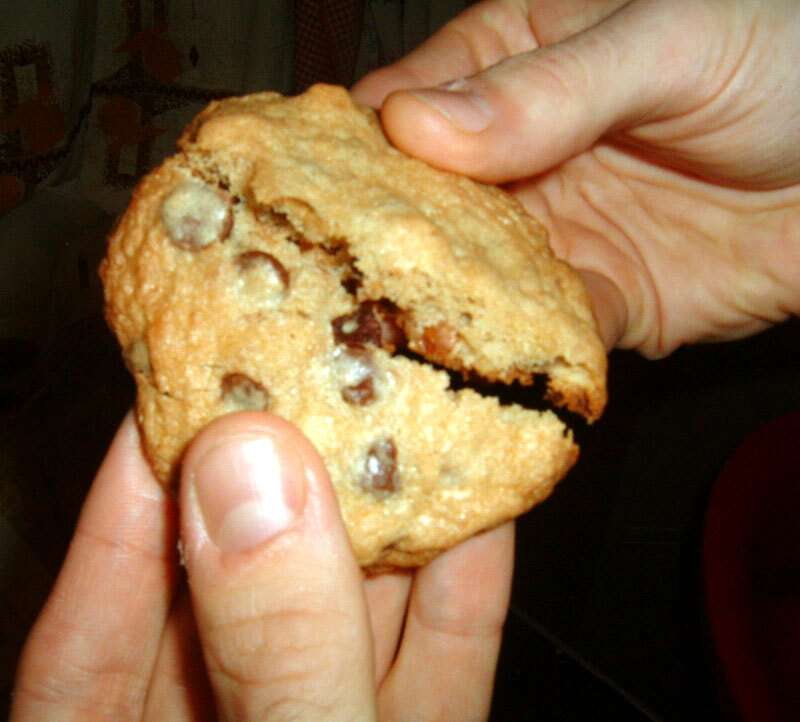 I made the “killer chocolate chip cookie” recipe from Entertaining for a Veggie Planet by Didi Emmons. Not only is this a great cookbook but these cookies were delicious. They’re definitely the more traditional kind of cookie that I remember eating as a kid (no sunflower seeds, no oats, etc.) and the cookie batter was so delicious that I had to apply serious restraint to keep digging in with a spoon. Toasting the nuts gave the cookies a great flavour and I think I’ll try to do that with other desserts I bake. Yum! As for the picture, that is Cornelius’ hand just waiting to bite in! 1. Preheat oven to 350 degrees. Spread nuts on a single layer baking sheet for 5 minutes or until golden brown. Set aside. 2. In a large bowl, beat the butter until creamy. Gradually add the brown sugar and sugar, beating well until mixture is very light in texture. Add the vanilla and salt, and then the egg, beating just to incorporate. With a rubber spatula, fold in the flour, baking soda, chocolate chips and nuts. 3. Spoon rounded tablespoons of dough 2 1/2 inches apart onto ungreased baking sheets. Bake for 6-8 minutes, or until the cookies are just a tiny bit golden around the edges but are still white in the centres. Let cool for 5 minutes on the baking sheets before serving. Hi! Just wanted to say I really like your blog. Those cookies look fantastic! Thanks, alicat! I know, I can’t believe I’ve never toated nuts before adding them to a cookie recipe! It was a pretty tasty discovery.